The number of home mortgages recorded in Spain was 2 per cent higher in March than a year earlier, raising hope that lenders are finally ready to support the residential market. The increase was the first recorded by the National Statistics Institute since 2010. The total amount lent on homes was up 7.7 per cent compared to a year earlier, reaching €1.7 billion. Significant increases were reported in several categories, including the average value of the mortgages, which was €102,397, a 5.6 per cent increase from a year earlier. 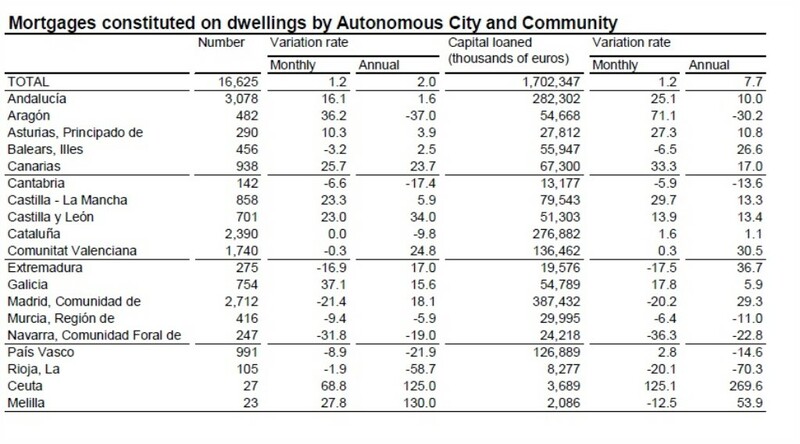 The value of mortgages on urban property rose to €3.4 billion, an 18.7 per cent increase from the same month in 2013. The data will certainly lead to speculation that lenders are ready to restart financing again. But that may be premature. The agency noted that Easter fell in April this year, but the holiday was in March last year, which may skew any conclusions about the results. “It is desirable to wait for the data of this survey in April, since it will then be possible the data of both months together,” the agency cautioned. On an anecdotal basis, industry professionals still say lending is very restrictive, with bankers showing confidence primarily in either the high-end of the market and or extremely discounted low-end properties, not the broad middle class of the market. But any data suggesting mortgage approvals are increasing will be welcomed by the industry. The average interest rate on a home mortgage fell to 4.04 per cent, 5.3 per cent lower than in 2013, which is also good news for a market hoping to convince buyers Spain housing is a good investment. Increase in mortgages would be a great sign if. Banks had not been told by the ECB to put their assets in order NOW! Therefore Banks are dumping property a daft prices. And incredibly Banks are lending again at 100 to 110% just to get rid of their toxic assets. Oh for some good news.